Telescopic handles, four caster wheels each that all have full 360-degree motion, built-in handles, extra-large front pockets – these are just a few of the reasons that I wanted to take a moment to talk to you about the Cool(er than)Life 3-Piece Luggage Set. Telescopic handles aren’t new – companies have been adding these handy devices to their luggage for years. But one thing I’ve noticed over the years is that these handles rarely come high enough for tall people. Imagine that you’re tall and you have a bad back – bending or slouching in order to move your suitcase around really isn’t ideal, is it? If what I’m saying is hitting close to home I must assume that you’ve actually experienced this. Well, tall back-pain people, your complaints have been heard and your prayers have been answered. The telescopic handles on these suitcases actually go high enough to accommodate your height! They don’t require that you bend and stoop! Wait a minute, though. What about short people and those of average height? No worries. Although the handles are capable of being pulled high, they are also capable of stopping at one of two midpoints for people who don’t need them to reach nearly as high. This multi-level height adjustment has been incorporated into small suitcases for some time now, but not the tall suitcases in a set. This is a big part of what makes these suitcases different from the others out there. It’s not unusual for a soft case suitcase to have pockets on its front. In fact, it’s actually quite common these days. But have you ever struggled to actually get anything into those pockets? I know I have. They’ve been useful at holding little more than a cell phone or a magazine for me most of the time. What I love about these suitcases, though, is that the pockets are actually large enough to use for storage. Since they stick out a little bit and have some good “stretchability” (yes, I made up that word just for these pockets) they can easily house multiple slim objects or a bulky one. Now I can store my laptop (safely in its own case) inside the front pouch. All my important travel documents will actually fit in the top pouch, too. And when I’m not on a business-related trip I can slip my sandals into the large pocket. We all know that the people who handle our luggage aren’t always the most gentle people on the planet. It’s not a judgment, just a fact – they are busy folks and it would really slow things down at the airport if they handled each piece of luggage with ultimate care. Thankfully, these pieces are pretty durable, despite being made with soft shells. One thing that really increases their durability is the integrated side handle. It is this handle that the luggage transporters often use to grab your bag and toss it wherever necessary. When these handles are sewn on or glued on or even bolted on afterward, they can come loose as they are pulled on over and over again. The integrated handle on these suitcases, however, is built into the body of the case itself. That baby isn’t going anywhere anytime soon. 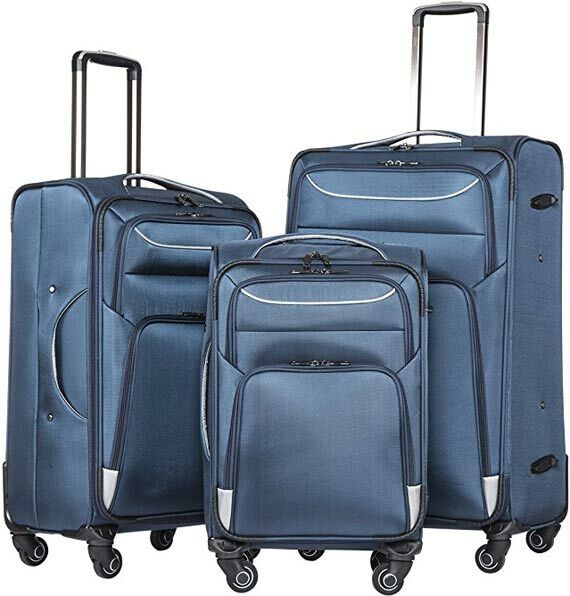 As these meet the standards for U.S. air transportation, you should be easily able to fly around inside the United States or use any U.S.-based airline with these suitcases. The smallest one is even the correct size for use in the overhead compartment as a carry-on. So, if you’re like me and don’t like carrying a duffel bag with you onto the airplane, you’re in luck. What about weight requirements? Well, that will depend on what you put inside! What I can tell you, though, is that in terms of SPACE, the small piece can hold 38L, the mid-sized one can hold 60L, and the largest one – your best travel companion for those long trips – can hold 93L. Don’t want the typical blue or green or tan or black suitcase but also don’t appreciate the sideways glances that come with pink polka-dotted suitcases? I get it – bold isn’t for everyone. You don’t need to struggle to find your case just because you don’t want to go bold. You can choose the grey and green, grey and yellow, or purple and silver versions of these cases. Of course, if you want to blend in with the crowd or just can’t pull yourself away from a favorite color, you can also choose the black and red, black and blue, or blue and silver set.